I am Swapna here with my post to share. This month’s challenge is Florals and hope you have entered already. Here is my inspiration for the challenge. I used In bloom Winnie & walter stamp set with various Hero arts mid tone and shadow inks. Stacked 3 happy diecuts and covered it with clear wink of stella and glossy accent. 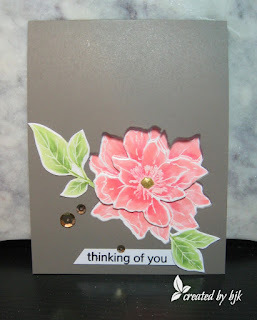 I Added glossy accent on flower centres and heat embossed strip also. Good morning! Emily Midgett here with you today… on July 24. I’ve been getting so many “Christmas in July” posts in my feed and email that I just had to pull out my own Christmas supplies and create a project! Luckily, both Hero Arts and our partner for the month of July, Winnie and Walter, have some gorgeous holiday stamps. I decided to step out of my normal creative box and do something a bit more monochromatic with a chalkboard technique. To start, I heat embossed the two deer from the Hero Arts Deck the Halls mini set by Lia Griffith onto some black card stock. Next, I placed the beautiful sentiment and foliage sprigs from Winnie and Walter’s Merry and Bright with Evelin T Designs in the center, along with some snowflakes from the Snowflakes by Lia mini set from Hero Arts, and white heat embossed them all. To create my “chalkboard,” I find that a combination of different strengths of white is important. I use white embossing, white pigment ink, white gel pen, and white colored pencil to create different depths on my card front. To my heat embossed panel, I stamped more snowflakes using white pigment ink, then added further little dots of snow using my white gel pen. I also added some little flourishes here and there with my white pencil. Finally, I swiped my white pigment ink pad around the edge of the black panel, then dabbed my finger in the ink and brushed it over the greeting and some of the snowflakes, to give the illusion that I’d erased something. The final step was to adhere my chalkboard panel to a shimmery white card base using dimensional foam adhesive! Now, it’s your turn! Simply use your Hero Arts stamps (and hopefully, Winnie and Walter if you have them!) to create your own project! The theme this month is florals, so pull out those pretty flower stamps and add your project to our link up! Be sure to follow all of the rules so that your project is eligible to win the prize from our fantastic sponsor, Winnie and Walter! Thanks so much for visiting! Have a marvelous day! Happy Friday, friends! Kimberly here with another dose of floral inspiration for you – have you entered our challenge yet? You can find out all the details HERE! For my card today I wanted to create a fun ombre look for my background. I blended multiple shades of Hero Arts Shadow Inks (Passion Flower, Bubble Gum, Soft Cantaloupe & Pale Tomato) to get the gradation. 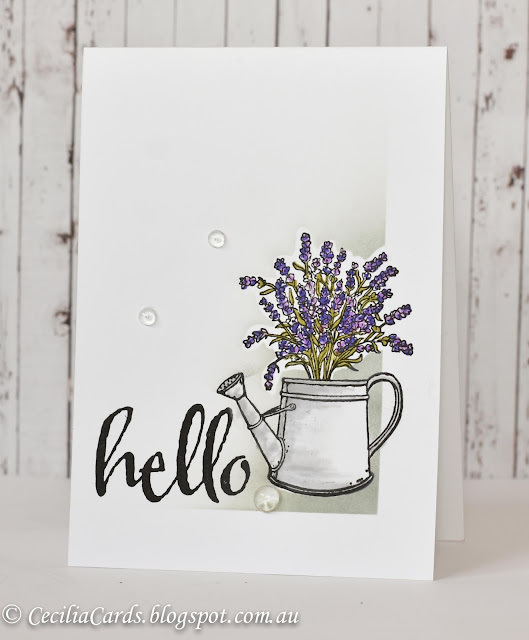 Next I stamped several of the flowers from Winnie & Walter‘s In Bloom: Eva’s Favorite Flowers all over my inked background. These flowers are too fun….they remind me of the Spirograph I had when I was a kid! To finish the background piece off, I sprayed the entire thing with Thermoweb Silver Glitter Dust. For the sentiment, I began by inking Versamark direct to paper and then coated it with Wow embossing powder in Midas Touch. After heat setting it, I die cut the Hero Arts Hello Stamp & Cut sentiment and adhered it in the center of the card. I stamped and heat embossed the supporting sentiment on a strip of black cardstock and adhered it with foam adhesive. 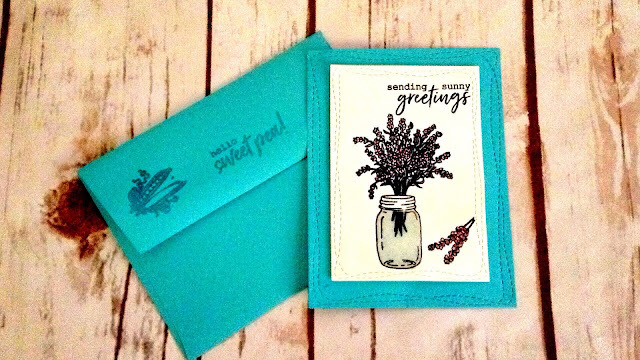 I love how the background sparkle and the sparkly embossing powder add that finishing touch to the card! I hope you join our challenge this month – I’m looking forward to seeing what you create! !